Ever Wondered Just How Old Or Fresh Your Eggs Are? 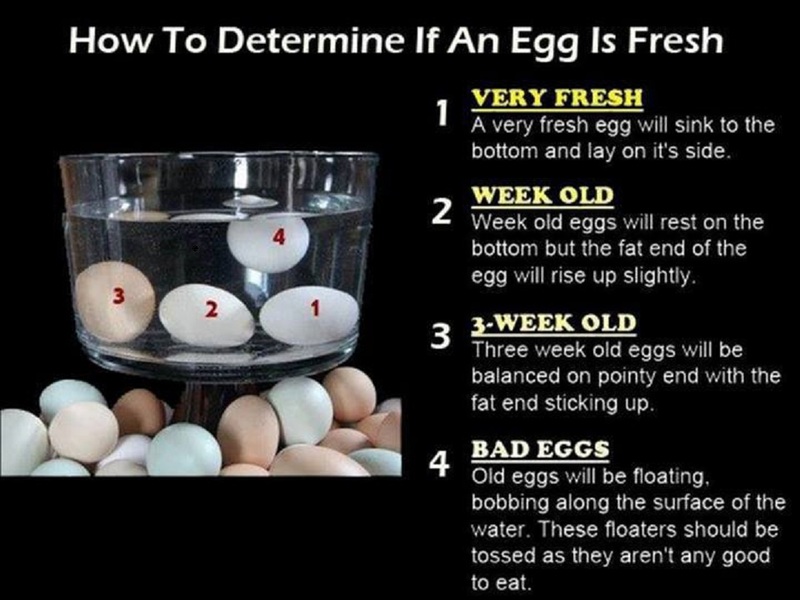 Very interesting chart to show you just how fresh your eggs are. A lot of people don’t care other then to know if the egg should still be used because of age. Did you know that there is a change in how the egg tastes and cooks depending on how fresh it is? For some bakers only the freshest of eggs will work because they swear that the freshest of eggs makes cakes more airy and are more consistent when baking goodies like cookies and other treats. Depending on how you like your eggs fried you may want freshest (fluffy) or older (for a denser consistency). However, you should always toss eggs that float because they are considered bad and may be unhealthy to eat. Print this out and keep it in your recipe book or tape it on the inside of a cabinet in your kitchen for reference. This entry was posted in Recipes, Tid-Bits & Funnies, ~Food and tagged bad, bake, baking, boiled, cake, cakes, cooie, cookies, dense, egg, float, fluffy, fried, old, omelet, sink, tip. Bookmark the permalink.